Pronounce Die Sec. What is a diseqc switch? If you look at the back of the receiver there is only one input for satellite , if you have one dish with one LNB attached to it then you are fine to connect to the back of the receiver. 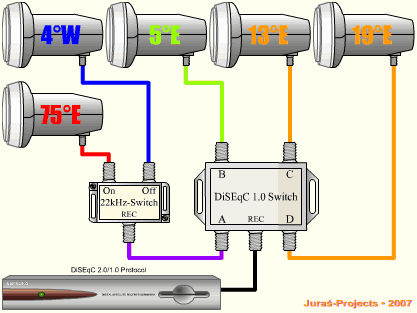 The diseqc switch allows you to connect up to 4 different LNB's (4 satellites) back to the receiver. each switch has a port usually labeled port 1 through port 4. Sometimes port A through port D. On the receiver you tell the installation setup which port on the diseqc switch is connected to which satellite. then you scan for channels. Most receivers come with a free diseqc switch from the manufacturer. These diseqc switches that come with the receivers are FREE and are of the poorest quality possible. The thought behind the manufacturer is we are providing you with a free cheap diseqc switch and there is no warranty on a free product. Most of the time this diseqc switch will do the job, sometimes right out of the box once connected they can blow very easily. For some receivers like the Sonicview 8000 HD and the VIewsat 9000HD they dont work very at all. It is highly recommended that when purchasing a receiver that is going to be used for bringing in more than one satellite from various LNBs that you upgrade to a better quality diseqc switch at least to a weatherproof switch or the EMP switch with a 4 year warranty. Most channel changing problems and loss of signal or even channels being there one day and not another day is because of using a cheap diseqc switch. It is also always worth having a spare diseqc switch as it is relatively inexpensive and the most common part to stop function or degrade over time. Another common problem is that when you have 2 receivers running from the same dual LNB they draw different voltages and when chaning from channel to channel sometimes the receiver will say searching fro signal. This is due to cheap diseqc switches that are unable to handle the load of two receivers from a single LNB. It is highly recommended for this kind of setup to use a higher grade diseqc like the Cheita, Zionsat or even better the EMP Diseqc switches on your setup to eliminate this problem. Another Very important tip is to make sure the receiver is turned off at the back using the switch when connecting the diseqc switch or connecting anything to it, as there is small amount of power going through the cable with the receiver turned on that can easily blow a poor quality switch. Regardless of the quality of the switch ALWAYS TURN OFF THE RECEIVER FROM THE BACK when connecting or adding to a port of a disqec switch, This is very good practice and will save you both time and money. 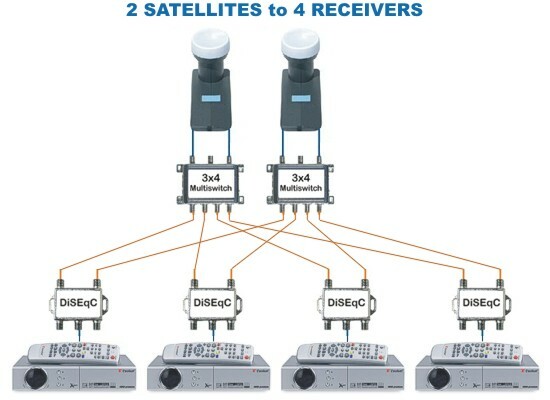 For most people a diseqc switch is enough to complete their Free to air Setup in terms of switches, however there are limitations to switches, firstly you can only connect 4 satellites to a diseqc switch, what happens when you need to go over 4 satellites, even the receiver only has defined port 1 to port 4 so how do i connect more than 4 LNB's (4 satellites) to my receiver? On your receiver you will see a selection in Antenna setup called 22KHz the default setting is always off. By connecting a 22 KHz switch to your setup you can get a fifth satellite by using one port on the diseqc connected to a port on the diseqc switch and that port is used twice on your receiver one time with 22KHz on and the other time with 22KHZ off. Above is a 22Khz switch that has 2 diseqc switches connected to its output one diseqc switch port 1 through 4 is 22 KHz on and the other diseqc switch ports 1 through 4 is 22 Khz off. This switch by passes the diseqc switch command and is a special 22 KHz switch, in our products section under switches this is the switch that is described as a Bypass diseqc command 22Khz Switch. Using a 22 Khz switch allows us to connect more than 4 satellites to one receiver. With Dual LNBs you can repeat the same setup for another Free to air Receiver. But this only takes you to 2 receivers now what happens when you have more than 2 receivers that you wish to connect? Multi switches allow you to use a dual lnb or multiple dual LNB's to get more than 2 receivers connected to your LNB. Outdoor multi switches allow you to use each dual LNB to connect up to 4 receivers as shown below. The above diagram is for 2 LNBs to 4 receivers you can also add another 2 LNBs following the above example and another 2 multi switches to get 4 satellites and 4 receivers. the above multi switches work very well but they are intended for outdoor use. If you are willing to run all your cables into your house from your LNB's then from one central point within your house run a single cable to each receiver then a powered EMP Multi switch is the way to go see our switches section for diagrams using the EMP line of indoor switches (note EMP switches can be used outside if housed or covered providing you have a power source outside and can protect the switch from weather conditions. However the EMP powered multi switches are meant for indoor use.